Full length protein: Rat pancreatic elastase. Our Abpromise guarantee covers the use of ab21593 in the following tested applications. WB: 1/200 - 1/500. Predicted molecular weight: 29 kDa. Efficient protease with alanine specificity but only little elastolytic activity. Immunohistochemistry (Frozen sections) - Anti-Elastase antibody (ab21593)Image from Anderson KR et al, BMC Dev Biol. 2009 Dec 10;9:65, Fig 4.
ab21593 staining Elastase in whole mouse embryos by Immunohistochemistry (PFA perfusion fixed frozen sections). Immunofluorescence was performed on e14.5, Nkx2.2-/- whole embryo frozen 8 µm sections that were fixed overnight with 4% paraformaldehyde. ab21593 was used at 1/1000. DAPI was used at 1/1000 and incubated for 30 minutes. Confocal images were taken on a Zeiss META LSM 510.
ab21593 staining Elastase in Mouse pancreas tissue sections by Immunohistochemistry (IHC-P - paraformaldehyde-fixed, paraffin-embedded sections). Tissue was fixed with formaldehyde; antigen retrieval was by heat mediation in a citrate buffer. Samples were incubated with primary antibody (1/300 in BSA + TBS) for 30 minutes. 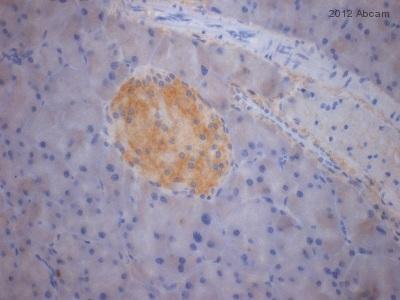 An undiluted Goat anti-rabbit HRP polyclonal was used as the secondary antibody. Publishing research using ab21593? Please let us know so that we can cite the reference in this datasheet. I would like to test ab9535 in FFPE canine tissue, test ab21593 in FFPE mouse tissue, and test ab74868 in FFPE rat tissue? I am very pleased to hear you would like to accept our offer and test these 3 antibodies in either dog, rat or IHC-P. Eachcode will give you: 1 free PRIMARY ANTIBODYbefore the expiration date. To redeem this offer, please submit an Abreview for either dog, rat or IHC-Pand include this code in the “Additional Comments” section so we know the Abreview is for this promotion. For more information on how to submit an Abreview, please visit the site: www.abcam.com/Abreviews.